Hushcloth® Embossed Foams (EM) and Hushcloth® Embossed Foams with White or Black Urethane (BCF) are manufactured by compression under high heat to form an attractive textured pattern. 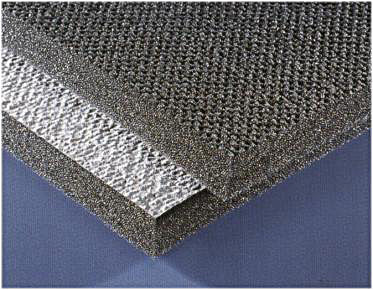 This increases the surface area, density and stiffness of the foam for maximum sound absorption. By densifying the surface a thin skin is formed to give greater abrasion and air velocity resistance. A decorative urethane facing can be applied for enhanced appearance and durability, and to make the foam impervious to most liquids. Hushcloth® Embossed Foams are typically used in business equipment, appliances, HVAC units and under vehicle hoods. • Potential to combine with Whispermat™ barriers, Whisperdamp vibration damping sheet and Pressure sensitive adhesive for ease of application.